We're on the countdown now. Just two and half weeks of The Puppy Show remain for our viewing pleasure. 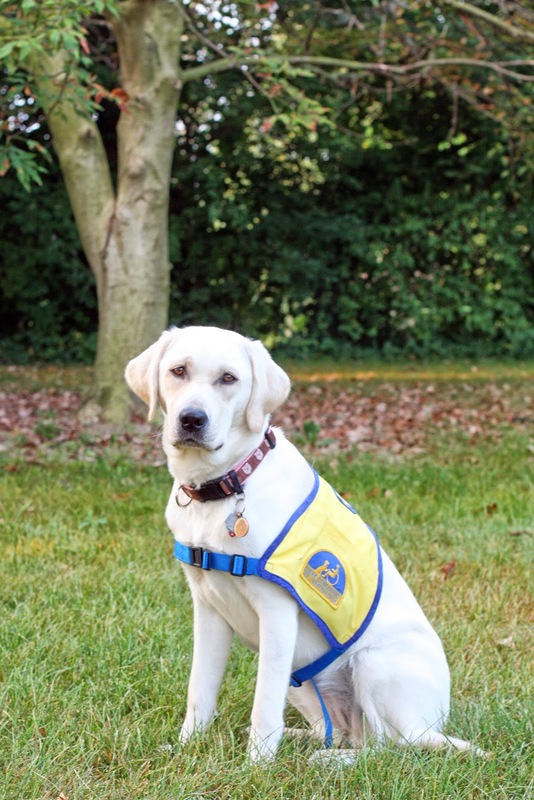 Click in while you still can to see the Canine Companions for Independence Hero Litter in action. Seven yellow puppies growing before your very eyes. Some faster than others. Yeah, I'm looking at you, Harvest, you big fluffy. *Oh, you want the full lyrics do you? Well here ya go. This is for everyone out there who was doing penance as a Cub Scout Den Leader at one point in their lives. Ask me sometime about The Littlest Worm. It's a fave of mine. This is to the tune of On Top of Old Smokey, of course. Bonus points if you make it a Repeat After Me song. How old was the puppy when you got him? asked the young man. Yaxley was eight weeks old when he arrived from California, answered The Husband. Yes? Next question? What are you training him to do? asks another audience member. The Husband fields this one, too. 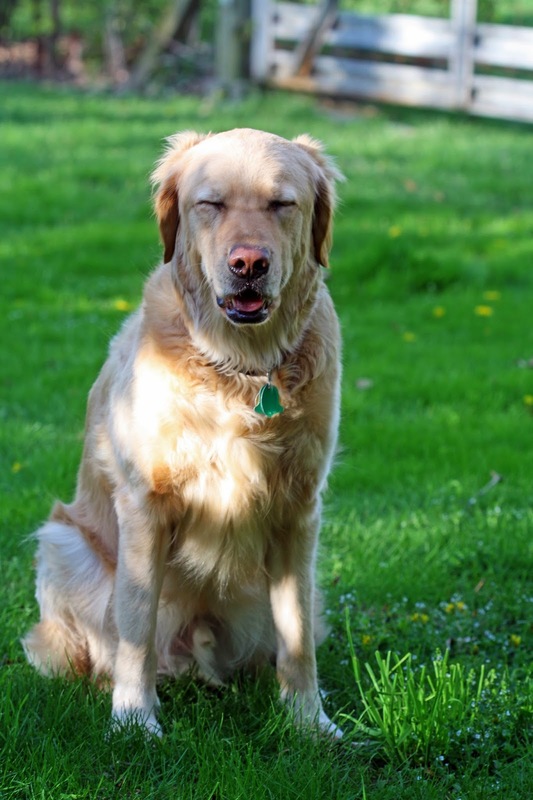 We introduce thirty commands, mostly the basics you'd want to teach any dog. Plus a few that will be used when Yax goes to Advanced Training. And we spend a lot of time socializing him. Any other questions? We have time for one more. We're just about to wrap up this presentation to this Bowling Green Chapter of the Delta Chi Fraternity. The members are considering offering a donation to Canine Companions for Independence. With Yaxley, our third puppy with CCI, to impress these fellas we're working this gig the best we can. And another hand goes up. Yes? You in the back, says The Husband. Is it true, asks this future business leader of the free world. That you replaced your son with a dog? Ah, there ya go. We got us a smarty pants in our midst. The Canine Companions for Independence Hero Litter is now five weeks old. We're continuing to spotlight this litter on our Wordless Wednesday posts. Click here to see the newest Week Five photos courtesy of Chris Kittredge Photography. Now that the Hero puppies have hit their five week milestone, our time to watch their acts of derring do on the Eukanuba Puppy Cam livestream in down to about three weeks. 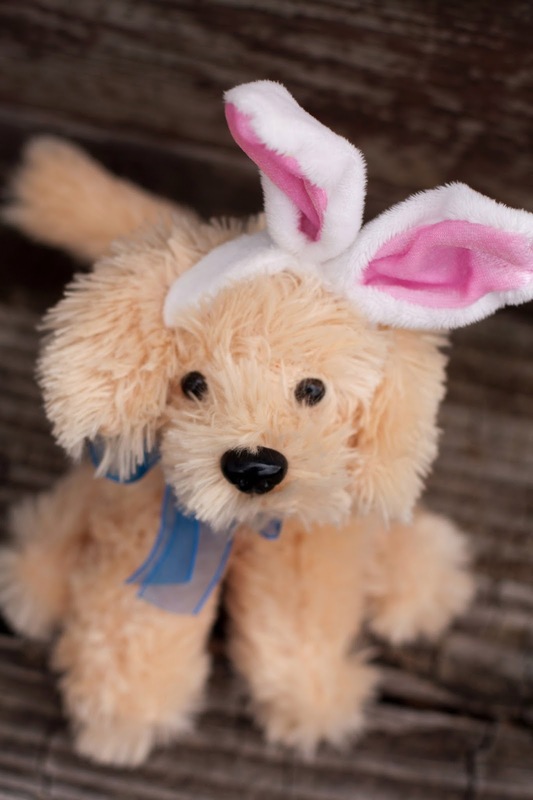 We don't have the actual date to share with you yet, but we're expecting these furries to be delivered to their puppy raisers near their eight week birthday on May 18. 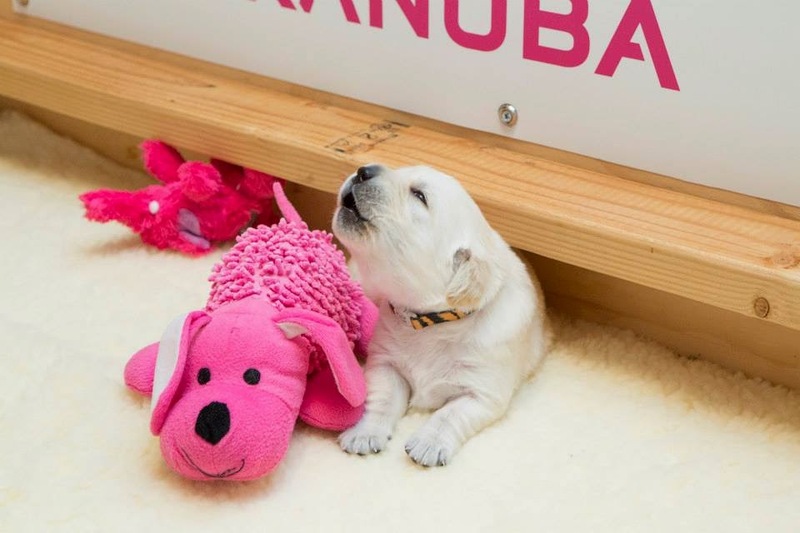 Neon Pink Collar - named by Eukanuba’s Facebook followers; Named in honor of Canine Companions’ CEO Corey Hudson who will be retiring this year after 24 years of service. Turquoise Collar - named in honor of Eukanuba. The term "Eukanuba" originated in the 1940’s by late jazz musician Hoagy Carmichael meaning "The Best!" Brown Collar. Pronounced like jalapeño. Just named through Canine Companions online puppy naming challenge contest; described by voters as sweet, unique and joyful. Don't know about you, but here at Raising a Super Dog, we've been watching Holly girl. And we've got good reason to. Stay tuned for more about this exciting little fur-covered news item. Hey Micron! says Euka. You big goldengoober! Lookit! Look at what, Puppy Piddler? asks Micron, annoyed. He doesn't look up from chewing a stick. It's a good stick. Fresh from the mulch pile. 'Member the time you smashburgered me into the ground? says Euka. You know. That one time, says Euka. When Food Lady was gonna take me to the grocery so I could work on my fan base? And then she said I couldn't go because you made me all muddy? Just on one side, says Micron. If you could manage to keep a good Heel, nobody would even see. Why? Why? asks Euka. Why? Because this is YOU! And I'm gonna smear YOU into the ground for once! What's that now? Finding myself amind yet another round of sibling smack talk, I admit to blocking most of this out. It's all grr-grr this and rowl-rowl that most of the time, anyway. But the mention of somebody getting pounded gets my notice. Euka, I say. What are you ... No! Drop! That's for the photos! A wet willy. 'Cept you're not supposed to like it. 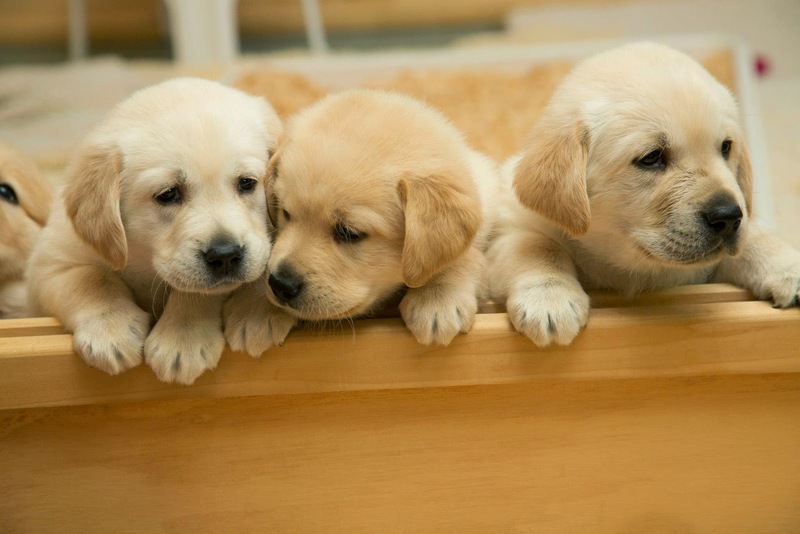 The Canine Companions for Independence Hero Litter is now four weeks old. 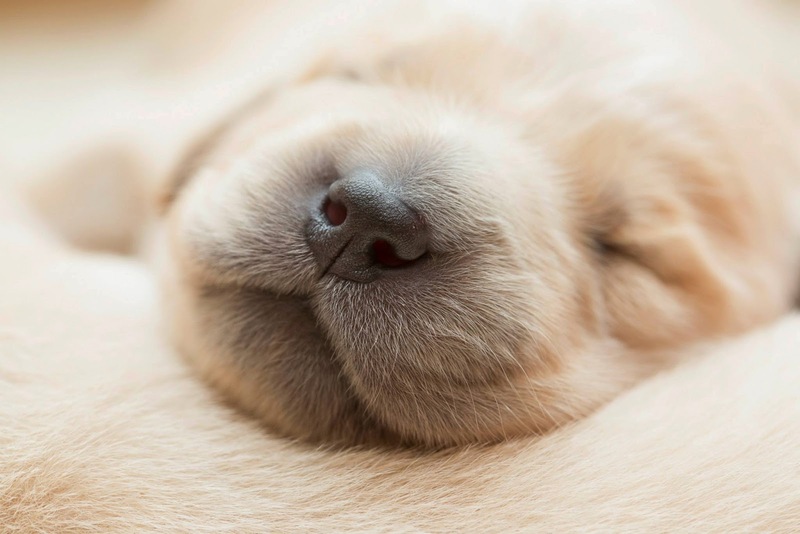 We're continuing to spotlight this litter on our Wordless Wednesday posts. Click here to see the Week Four photos courtesy of Chris Kittredge Photography. Now that the Hero puppies have hit their four week milestone, this means we're at the halfway mark with only four weeks left to watch them on the Eukanuba Puppy Cam livestream. It's been a big week for these furries, what with their new playground area full of sensory experiences and their introduction to solid food with the Eukanuba weaning diet. Even my back side is my good side. What's with the index cards, Food Lady? asks Euka. Aren't you supposed to be writing about me on my website? It is Sunday, you know. Oh hey, here's my best side. Take a picture. Heh, who am I kidding. All my sides are my best side. Ah, Euka, glad you're here, I say, setting down my pen. I was just about to call you. You are correct, my love. 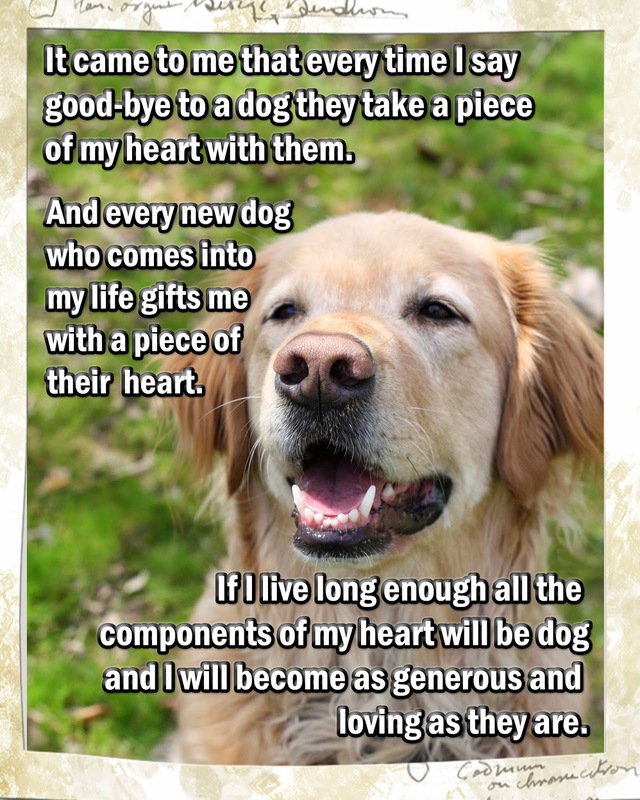 It's indeed your turn for this week's Story Sunday on the dog blog. Which, I need to remind you again, isn't just your website, Princess Golden Hair. You need to share the glory with the other four leggers that live here. Kind of? Euka tosses her ears back. Hello? I've been on television! Right. I say. But only because we hooked up the laptop to the plasma screen. Still, it was pretty awesome to watch you over those first eight weeks of your little, furry life. I remember watching from your first day in the world -you and your extraordinary E littermates- when you all were livestreamed by Eukanuba. * You critters worked it hard to build your fan base over those two months in California. Then we welcomed your little polar bear self at our place here in Ohio (The Heart of America!) and we've been telling your stories to your fierce and loyal followers for the last year and a half. All our adventures together and now ... just a sec. Darn it, hold on. I have something in my eye. I pause to dab at my eyes. Blow my nose. And now, Euka, we have only five weeks left. [sniffle] So I was thinking, let's do an interview before you leave here to start dog college. An interview? asks Euka. You mean when we talk about me and nothing else? I'm in. You may start. Yoo Ka Noo Ba! Sing it, little one. 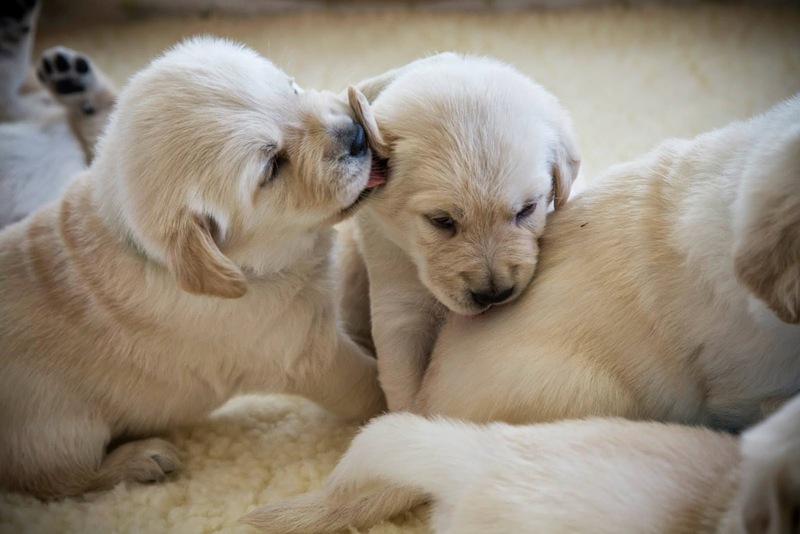 The Canine Companions for Independence Hero Litter is three weeks old and have we got even more adorable photos to share with y'all. Click here to see the Week Three photos courtesy of Eukanuba and Chris Kittredge Photography. Now that the Hero puppies have hit their three week milestone, this means we only have another five weeks to watch them on the Eukanuba Puppy Cam livestream. Things are going to start moving quickly now, you know. Eyes are opening, muscles are forming and the furries will be up on their feet and romping out in the way that carefree puppies do. Are we doing anything Saturday night? I glance up to see The Husband holding his iPhone to his chest. I dunno, I say, Just a sec. I fire up my Droid for a quick look at the social calendar. Nope, looks clear, I say. That task completed, I go back to my laptop and refocus on pinning vintage dog photos on Pinterest (Dogs of Yore board). Huh. Well, this will be interesting, he says. Whazzat? I look up in alarm. Did I just agree to something? Darn it, Pinterest. Looks like the boss can't attend a dinner to accept an award on behalf of the business, says The Husband. So he asked us to go in his place. Oh, do stop, I say. You had me a semi-formal. Lookit, I'm not a fancy girl. 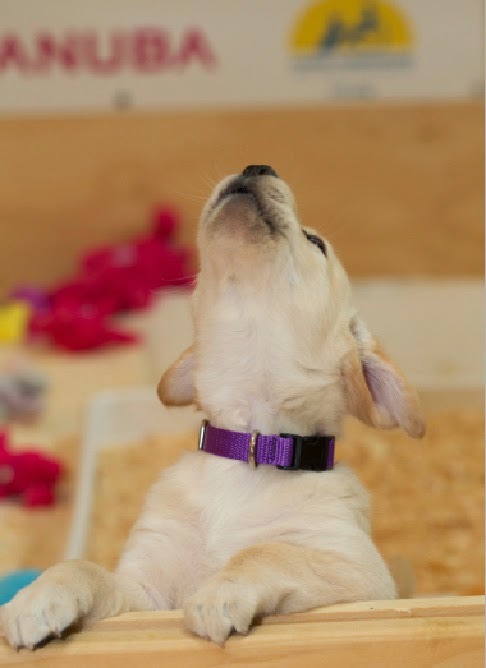 The Canine Companions for Independence Hero Litter is two weeks old and have we got some ridiculously adorable photos to share with y'all. Click here to see the Week Two photo session as presented to us by Chris Kittredge Photography. Oh, but be sure you have the spare minute. Just a guess here, but you find yourself rolling through the album a couple of times to absorb all the essence of this sweet puppy goodness. Now that the Hero puppies have hit their two week milestone, this means we only have another six weeks to watch them on the Eukanuba Puppy Cam livestream. As a volunteer puppy raiser for Canine Companions for Independence I encounter extraordinary people and their canine partners. These are my stories about sharing life, family and home with incredible dogs. We publish twice weekly on Sundays and Wednesdays. Which is more than I vacuum around here. Dog hair is a condiment. Or so I tell everyone at the potluck dinners. As a disclaimer, this blog is my personal journey; CCI may or may not agree with my thoughts as I share them here. We do hope you enjoy reading our adventures. We're having a blast here. All photographs and text on this website are the property of Donna Black-Sword and may not be used for any purpose without permission. Please contact me at puppysword@gmail.com if any interest in using an image for your website or print materials. Follow Dog hair is a condiment on Pinterest. Got to see my PR's again! PJ III graduated as a Facility Dog! Bring Cara Back! Stolen Service Dog! The Science Dog | Dogs. Science. Cool Stuff. Big Corgi News, and even BIGGER Corgi News!